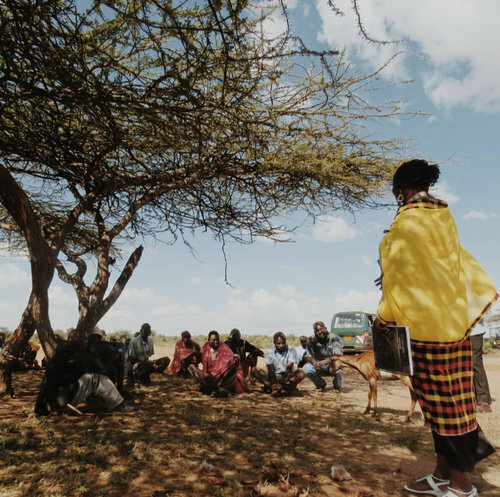 Editor’s Note: In the summer of 2018, Conservation International (CI) held a weeklong workshop on Indigenous negotiation training and exchange with partners in Laikipia County, Kenya. In this two-part series (read part one here), Vince McElhinny describes the experiences of two Kenyan indigenous partners defending their rights in the context of negotiations with development projects on their lands. As we know from experiences in other conservation activities, indigenous communities are never a homogeneous block, and negotiations capacity building must be handled differently for different stakeholder groups. An example of this comes from a field visit on the 2nd day of the workshop to the Lewuaso community, located in the mid-western part of Laikipia County. From the male community members, we learned how the community had negotiated with the power company to give up land to make way for a high voltage transmission line. Pointing to the string of transmission towers along the horizon, the men from the Lewuaso community carefully pieced together the story of how they signed over their land in exchange for a lump sum - a deal most felt pressured to accept. The Maasai people rely heavily on livestock for currency, and in the midst of a severe drought in 2017, the community used the little money that was compensated to them by the electricity company to buy new livestock and pay legal fees resulting from a grazing conflict rather than paying for their children's school. Similar complaints were heard from affected Samburu and Turkana peoples to the North. It became clear that many were unhappy, but there were divisions among the leaders about why. When the women were asked if they benefited from the royalties paid by Kenya Electric Transmission Company (Ketraco) to build the high voltage power line, they answered "yes" in unison. When Martha Ntiopo, a Maasai woman from Tanzania, former CI fellow and one of the workshop participants went to the women one-by-one, however, the women told her that their husbands kept the portion of royalties that was supposed to come to them or to be spent on their children. Martha then stood to address the men, "From Maasai to Maasai, you have settled for less than you could have. You are divided. The women told me they knew less of the compensation that only the men speak of. How can Maasai not be unified in the face of these challenges?" A new threat loomed that only added a greater sense of urgency to our discussion: a large dam is planned on the nearby Ewuaso River, which will flood community land and restrict access to sacred resources. As herders and farmers, Lewuaso families are also beekeepers, successfully using their traditional knowledge to supplement their income by harvesting and producing a high quality honey. The beehives are placed inside hollowed out logs and hung inside Acacia trees, which grow alongside the riverbanks. The riverbanks are also the source of medicinal plants and are considered sacred by Lewuaso elders. The proposed dam would flood an estimated 2700 hectares of land, including parts of their Group Ranch, the river banks they depend on for their livelihoods, and a 500 acre conservancy recently established by several communal ranches. The Lewauso story that was shared among allies illustrates several key insights. In negotiations, not all stakeholder groups are created equal, and although the natural inclination might be to think of an indigenous community as a homogeneous block united by common interests, successful capacity building must address inequities within the community. Secondly, unity of purpose is one of the core negotiation principles that our workshop was designed to reinforce. Without it, few negotiations succeed. Finally, negotiated agreements are happening across critical landscapes and seascapes of the global south, but not necessarily in ways that fulfill the spirit of the rights associated with FPIC or ensure protection of natural resources. Like many indigenous groups across East Africa, the fate of their land is dependent on their capacity to defend their rights. Indigenous foresters, farmers and fishers are fighting to secure their resource rights in every place CI works. Indigenous people safeguard one fifth of all tropical forest carbon and much of world's biodiversity Partnership with indigenous negotiators and the communities they represent is crucial for safeguarding nature's multiple benefits for society. The regional workshop in Kenya is the first in a planned series of training and learning exchanges to inform the design of an Indigenous Negotiation Training of Trainers program. The next exchange is planned with Asian Indigenous Peoples Pact (AIPP) in Chiang Rai, Thailand in early January, and plans are underway for a third workshop in Peru later in 2019.